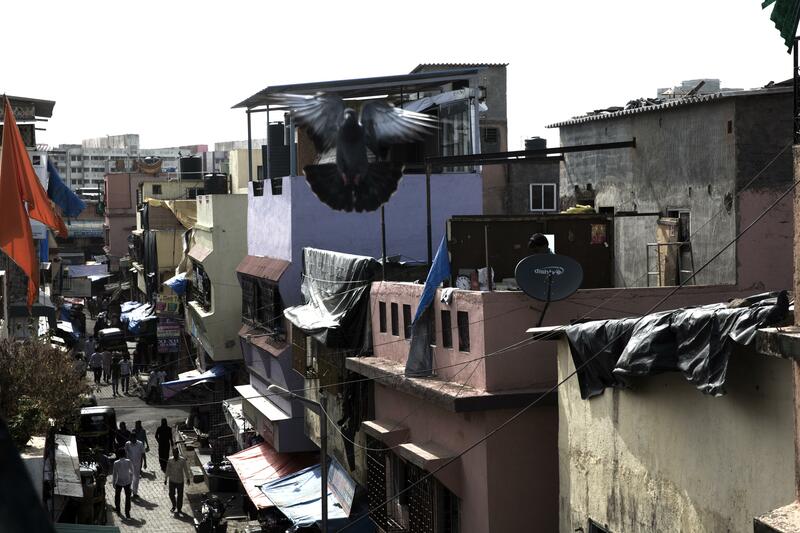 Residents of the Omkar municipal chawls in Dharavi have been fighting for their right to self-develop for years, which the government is denying them. Housing in Mumbai is a phenomenally complicated issue, and one of the hardest challenges faced by the governmental and private developers. Housing provision on the megacity scale of Mumbai, is perhaps an irremediably speculative exercise: trying to find places to put people, and buildings to fill those places that residents will actually want to live in. This is something of a superhuman task: successful housing schemes should not only predict the caprices of the world economy – every butterfly flapping its wings and collapsing or inflating global housing markets – but they should also predict future family structures, aesthetic values, social dynamics, class systems, and ‘tastes’. All of this being contingent on the same chaotic global economy along with complex socio-demographic trends. This complicated balancing act is nothing new. Politicians and bureaucrats have struggled with it ever since the city’s population started increasing at a rapid rate and the economy industrialized. Then as now, the questions remain: how to provide housing for all classes of people who need it, taking their varied livelihoods and tastes into account, while balancing their relative abilities to invest in housing and keep on attracting the capital that propels the city’s economy—all on a relatively tiny amount of peninsular land. In the early 20th century, concerned letters and memorandums started to go back and forth between—oddly enough—the Department of Education and the two-headed monster of the Municipal Corporation and the board of the Improvement Trust, concerning the severe housing shortage for poor and working-class residents. In 1917, the problem was first raised, then in 1919, it was brought up again, with a note that the situation had only worsened in the face of inaction. Existing plans to erect poor-class housing had stalled out or never gotten started, and blame was being bounced around various government departments. So an awareness of the problem of housing was never really a problem—just how far it had been a priority, and a financial priority at that. Then there was the question of providing housing that people would actually move into: even earlier in the 20th century, a 1901 letter from the Superintendent of the Government Central Press in Bombay in response to a question of providing housing for government employees offered an illustrative anecdote of previous problems. During the plague of 1896, he said, while facing a mass labour exodus, government had negotiated a deal with the 800-odd workers of the Central Press: they would stay and continue work if housing in a cleaner, safer suburb was provided, along with cheap rail cards to subsidise the ensuing commute. The housing was provided—however, of the 800 workers it was provided for, only 62 actually moved in. Dangerous or not, they decided, they would rather remain close to the families and social networks they had built up in the areas where they lived. From this, the superintendent made several recommendations: for any other government housing schemes to be successful, he said, they had to provide three things: low rents (1-2 rupees per month); short (if any) commute times; and space for workers’ families to join them. Unfortunately for dwellers and municipal development authorities—it’s often the failed experiments like this one that are the most instructive. Obviously, in the case of the press workers, certain values like family support and responsibilities negated what benefits could be offered by government housing. Similarly, a recent article in the Times of India indicates that issues of competing values unrecognized by authorities may still be hampering government efforts at providing housing: a recent regulation approved by the Chief Minister will mean that 50% of municipal rental housing built by the Mumbai Metropolitan Region Development Authority (MMRDA) will be used as transitory housing for people whose current dwellings are slated for redevelopment or demolition (mostly “slum” residents). The need for affordable rental housing is evident in just how much housing prices have skyrocketed in the past several years, making affordable housing blocks a rarity in Mumbai. However, people as yet are wary of actually moving into transitory housing for fear of losing permanent housing in buildings to be redeveloped—meaning that the scheme will be difficult, if not impossible, to implement on a large scale. An issue related to losing permanent housing has also been a municipal headache throughout the 20th century: the question of who—and by who I mean which classes of people—is to actually live in government-provided housing. As the Chairman of the Improvement Trust Board wrote in 1920, “experience shows that in the past the persons displaced have not come in any great proportion into the chawls erected for them, but that nevertheless the chawls are very popular and seldom have vacancies; and adding that at the present time semi-permanent sheds for those who are displaced are erected on land situated close to the houses demolished and are readily taken up by the evicted tenants…” So people were moving into government-provided housing, but these were more often residents of other areas than the ones supposed to be rehoused, seeking affordable housing. A strikingly similar phenomenon poses issues for ‘slum rehabilitation’ projects today: a common scheme to incentivize developers to tackle otherwise non-lucrative slum redevelopment projects is to pass the land redeveloped into the hands of the developers after the completion of the project on the condition that they provide housing to at least a portion of the displaced residents. However, developers have tended to provide this housing in high-rise apartments, in part to leave as much of the land free as possible for more lucrative projects. These apartments, however, often come with higher rents than slum accommodation, and rapidly rising maintenance costs. These increasing housing prices soon make these unsustainable for the poor residents relocated to them, forcing them to sell to other speculators or middle-class buyers, and then move to another slum area not yet ‘rehabilitated’—thus perpetuating the cycle of slum formation. Perhaps part of the public policy that drives the continuance of this cycle is a hope still pinned on a theory first applied to housing in Bombay in 1920: when the Municipal Corporation raised concerns that the Improvement Trust had not been doing enough to address the housing shortage among the urban poor, the Trust replied that it was applying a ‘trickledown’ theory of housing. By focusing on providing attractive housing to the middle and upper classes, who could better afford to pay enough to keep the Trust afloat financially, the Trust was encouraging them to move out of the more congested areas of central Bombay and therefore open up their former housing to lower-class residents. This was also supposed to work in terms of providing more attractive, clean, beautiful spaces to encourage the investment of foreign capital, which would in turn boost the economy and also trickle down on to the poor. Essentially, keeping the rich happier was supposed to transitively also improve life for everyone else. For all that this is could have been written as a piece of policy by any number of neoliberal economists, it continues to sound like something of a cop-out, relying on the unbelievable ability of the urban poor to pull survival out of thin air until things—maybe—one day get better. However, as is evident from the cycle of middle-class ‘poaching’ of housing meant for poor residents, this trickledown theory only works if things continue to get better, if middle class people can afford the new constructions for their benefit and aren’t struggling to find affordable housing in the midst of an economic downturn like the rest of the socioeconomic spectrum. Until that is a guarantee, relying on trickledown theory to provide for the urban poor through incentivizing private action is rather a shirking of municipal responsibility to the people supposed to benefit most from a municipality, the people who pay into the public sphere to receive services that they cannot afford privately. Historically, relying on private developers to pick up the slack seems also unadvisable: as that same Education-Municipality exchange mentioned, “It may be remarked that the experience of housing difficulties in this country indicates that private enterprise in itself cannot be relied on to provide the adequate remedy.” Perhaps the adequate remedy is in a redirection of government responsibility, and a more nuanced view to meeting the needs of the urban poor and the welfare of Bombay as a whole.